We are all starting to adjust to the new higher price of fuel. Oil and energy prices have affected all aspects of our daily lives. Fuel prices are even higher in most of the cichlid collecting/breeding countries outside the United States. Higher jet fuel prices affect import shipments and higher gasoline prices affect fish collecting, slowly increasing tropical fish prices. The days of discount tropical fish and bargains may soon become a thing of the past. Since there seems to be no end to the fuel crisis in sight, waiting or delaying your next fish purchases in anticipation of future sales or better deals in autumn may be a mistake. Buy them now while the sticker shock may not be as noticeable. A few newer varieties of old favorites have hit their marks and are currently in demand. Collections from southern Congo seem to be slowing down, while collections and exports from Tanzania and Zambia continue unabated. 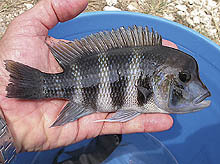 Exports of farm bred cichlids from Burundi and from breeders in other countries continue as usual. 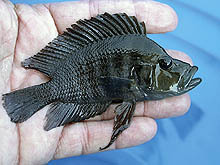 Collected from Nangu, Zambia, Altolamprologus compressiceps “coal black” sports a very dark black coloration, unlike the A. compressiceps “black” varieties from eastern Tanzania. Cyphotilapia frontosa from Karilani Island, Tanzania, have a yellowish dorsal fin, a bluish face, and 6 bars, unlike the C. frontosa from Kigoma. Recently exported from Zambia (although the exact location is unknown), Tropheus moorii “golden Kazumbe” has been well received by enthusiasts. 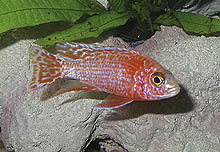 Exported sporadically in the past, Julidochromis sp. “kapampa” looks similar to both J. transcriptus and J. ornatus. It is collected in southern Congo. Sales of Malawi cichlids have been brisk as of late. Spotty shortages of some bred mbuna have also been reported. Collections of wild material from all around the lake have been strong. New species from Lake Malawi continue to be described and valid names are thus placed. Man-made varieties also continue to appear from different sources, and more can be expected in the future. The recently described Copadichromis chizumuluensis, found near Chizumulu Island, Malawi, is also known as C. sp. “chizumulu blue.” Photo by A. Konings. 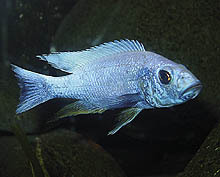 Exported infrequently, Labidochromis caeruleus “blue white” from Tumbi Reef, Tanzania; males sport a bluish sheen, while females are cream white. Another recently-discovered species, Metriaclima sp. “kingsizei masimbwe” from Masimbwe Islet (south of Likoma Island) is similar to M. pulpican, but larger. Photo by A. Konings. 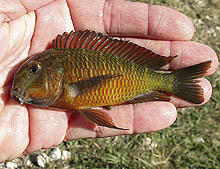 Reportedly from Mbamba Bay, Tanzania, Placidochromis sp. “mbamba” exhibits a strong orange coloration on their flanks along with the typical blue coloration. Photo by A. Konings. Exported from Far East fish farms, Aulonocara Ruby Crystal is an albino form that seems to be a hybrid of several varieties, as the color pattern of males is widely variable. 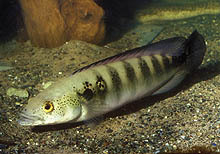 They are most always sold small and are treated with hormones to temporarily bring out the adult coloration. 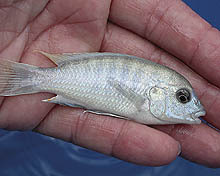 Descended from European selective breeding of the “Iceberg Electric Blue Ahli” (Sciaenochromis fryeri from Maleri Island), “ghost” males of this form display an almost completely white color when spawning. Photo by F. Callegari. A paucity of news on Victorian basin cichlids has created a void for some fans of these cichlids. Many of the Species Survival Program varieties released to US hobbyists are now difficult to find. Several species bred elsewhere on fish farms remain available, but in lower numbers. The Haplochromis Study group in Leiden, Netherlands has been working with other species, but these are infrequently available from commercial breeders in Europe. Hopefully, better news is on the way. 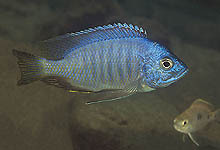 Originally collected in Uganda, Paralabidochromis sp. “rock kribensis” is found at several locations around the lake. Pictured here, the Ugandan form is less green and shows stronger horizontal stripes than the Kenyan form. 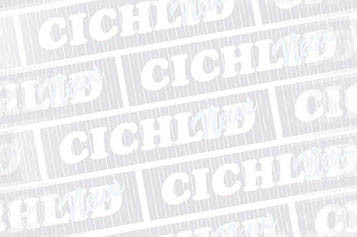 New cichlid material continues to be sold and exported from Guinea and Cameroon. Other seldom-seen species can be procured from West African breeders and enthusiasts. 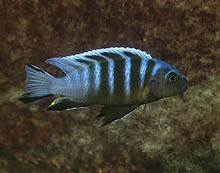 Congo and Nigeria also export cichlids in good numbers despite their political troubles. Tilapia tholloni is an extremely colorful and peaceful species. Infrequently imported or bred, this species can sometimes be found in shipments of Pelmatochromis nigrofasciatus from the DR Congo. Photo by A. Bornstein. An East African species, Alcolapia alcalicus is a small mouthbrooder that makes its home in the extreme environments of the Kenyan and Tanzanian soda lakes. Photo by A. Bornstein. The collecting season has just begun in many South American countries. Several newer cichlid varieties are now frequently exported from these areas. Specialty breeders continue to supply the hobby with both the hard-to-find and the more common, but colorful cichlids from the region. 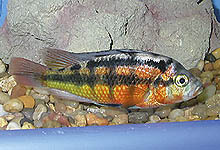 From the Rio Orinoco, Crenicichla lenticulata is a large and beautiful pike cichlid that is more frequently available from importers. Photo by O. Lucanus. 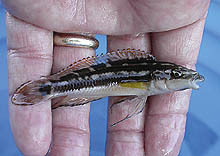 Apistogramma sp. “galaxy” is one of the many new species found in the Peruvian Amazon. Photo by O. Lucanus. Copyright © 2006 Aquatic Promotions, Inc. All rights reserved.